In November of 1888, Scientific American published an article on “The Making of Postal Cards” which follows, but I thought it needed a brief introduction on how postcards themselves came about. 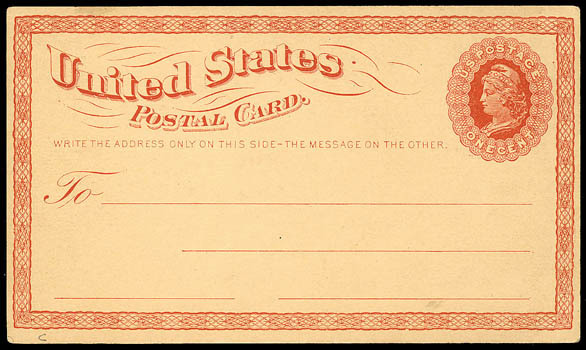 In June of 1872, perhaps exhausted by their own paranoia and fulminations, the members of Congress authorized the Postmaster General to issue postal cards on “good stiff paper, of such quality, form, and size as he shall deem best adapted for general use.” However, shortly thereafter, the original legislation was amended to specify that postcards could not be used to carry immoral, obscene, lewd or lascivious matter, indecent or scurrilous epithets, or information on the prevention of conception or the procuring of abortion. 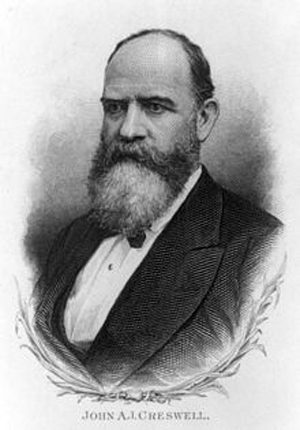 In January of 1873, funds were appropriated for postal cards’ manufacture and, because the Government Printing Office would not be established until 1910, Congress awarded the contract to a private printer. When the article below was written in 1888, that printer was the Fort Orange Paper Company. “The people of the United States use annually about seven postal cards for every man, woman, and child; that is to say, our total consumption for a year reaches 400,000,000, which is considerably more than are employed by all the rest of the world. This enormous number are all printed, cut apart, counted, and wrapped up in packages of 25, by machinery that would stand comfortably in a small bedroom, and that requires no assistance whatever from any operative, so long as it is supplied with paper, ink, and paste. A visit to the abode of this wonderful mechanism is naturally full of interest. “The postal card factory—the only one in this country—is part of the great establishment of the Fort Orange Paper Company (C.C. Woolworth, president) at Castelton, near Albany [N.Y.]. These works, employing 200 hands and occupying (though, of course, not covering) a tract of 35 acres of land, have quite a picturesque location among the hills a mile back from the village, with which they are connected by the New York Central, Hudson River, and Fort Orange Railroad—the name is about as long as the track—and include every appliance for the manufacture of many different kinds of paper and cardboard—white, brown, and colored. “Approaching this place from Castleton, one notices first the immense and very graceful chimney, founded on solid rock and rising 125 feet into the air—a tower-like structure of no little beauty. Around and near this are grouped a number of large buildings, one which we will enter, following the course of the raw material from which, in part, most kinds of paper are made—being bales of rags of every possible color, size, shape, and condition of dirtiness. “This unpleasant stuff needs a lot of cleansing, as may well be imagined, and accordingly the first thing done with it is to toss it by handfuls into a “duster,” where it is tossed and shaken at a great rate, and liberated, so far as may be, from adhering and extraneous dirt. “Next it goes to a long line of women and girls, who remove hooks and eyes, buttons, rubber, fragments of whalebone, and whatever other foreign material they find. “Then it is cut up by a fast-running, steam-driven machine into fragments of moderate size, dusted (or ought we say undusted?) again by another machine, and dropped into great boilers below, where for six or seven hours it is subjected to the action of a hot chemical liquid, under pressure, to loosen its color and its still remaining dirt. Coming from the boilers, it is then soaked for three or four days in a solution of chloride of lime, which bleaches it completely, leaving it pure snowy white. 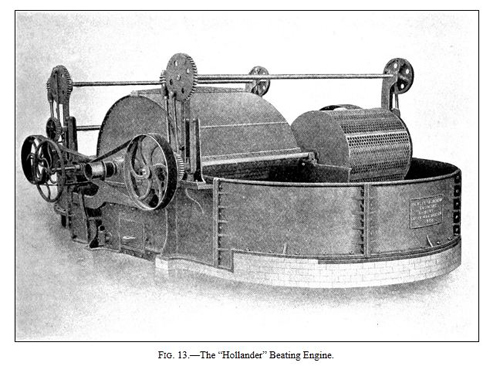 “It is next beaten and squeezed by beating engines until reduced to semi-pulpy condition, and then conducted into large hogsheads called “stuff chests,” whence it is pumped directly to the Fourdrinier paper machine. 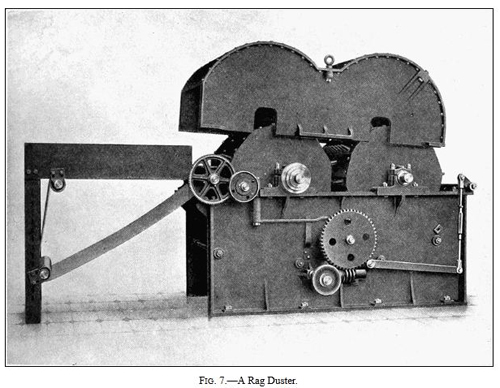 This imposing piece of mechanism, really a compound of a variety of machines by which a great number of operations are kept going simultaneously and harmoniously, receives at one end the pulp prepared as above, which comes pouring in from the stuff-chests in the form of a very thin, watery paste; and delivers, at the other end, the completed paper, calendared to its final surface, trimmed at the edge, and tightly rolled up like so much ribbon. “The pulp first flows upon a fine wire netting, where it is sharply shaken for the purpose of causing its fibers to knit together like felting and acquire some degree of consistency. 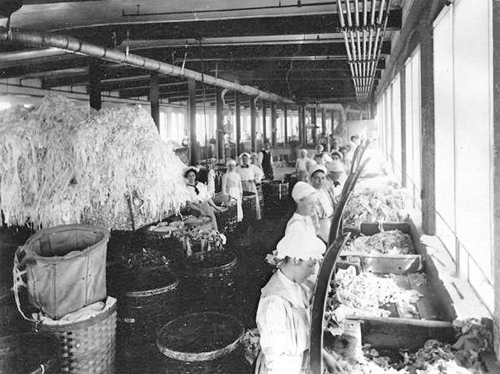 Then passing along on endless blankets, it is squeezed by a succession of rollers to get it into proper shape and remove the moisture (some of the rollers farthest along being steam-heated, to aid the drying), and finally pressed hard or “calendered,” to smooth the surface, and wound up in rolls. We should not think that more than two or three minutes could elapse between the entry of any particular portion of the pulp into the machine at one end and its exit from the calendars, [as] finished paper, at the other [end], and during that time it has traveled 125 feet. 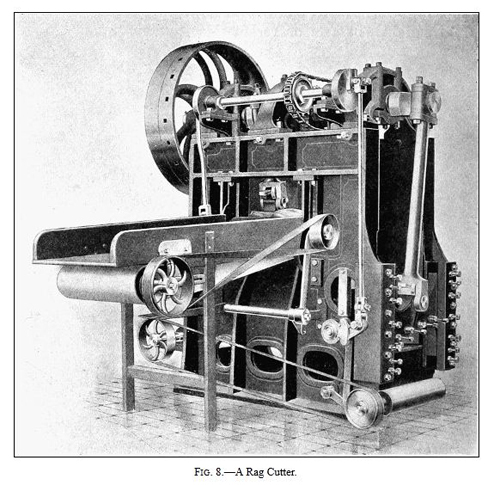 “Now supposing that it is postal card paper that we have been watching, we follow a roll of it to the printing room and see it put into the combined printing press, cutter, counter, and wrapper—a machine that the inventor thought he could construct in three weeks at a cost of five hundred dollars, but it actually took four years and eight thousand dollars. “This machine prints from a number of engraved plates on the surface of a fast revolving cylinder, against which the web of paper is closely pressed, thus repeating the pattern over and over again on the ribbon, as one might say; and then, as before stated, cuts the cards apart, wraps them up in packages of 25, with a band pasted around each, and delivers them by belt conveyors to the packing tables, where girls put them into paper boxes, each holding 500 cards. These again are inclosed in wooden cases of varying size, and shipped to every post office in the United States—so that the dispatching department of the works may be said to have some sixty thousand separate customers to attend to. And I thought one only needed to cut a piece of thick paper down to size and put a stamp on it. I’m impressed.